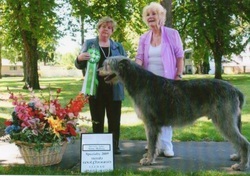 Looking for an Irish Wolfhound? 13. Legacy's Gwinn Dell Dublin Dream. HP13815201. 10-22-04. 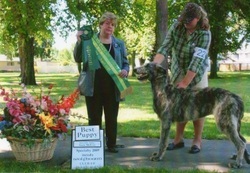 Breeder: Harley & Lisa Blanchard. By Stoneybrook Kozmopolitan x Legacy's Bewitched. HP119960/01. 9-30-04 Breeder: Mandy Tyler & Melanie Uva. By Ch. Kerryarc Cartier of Eagle x Ch. Kerryarc V.V.S.I. HP28926401. 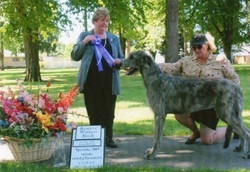 11-11-07 Breeder: Harley & Lisa Blanchard. By Legacy's High & Mighty x Legacy's Charm Bracelet. Hp305813/05 10-28-07 Breeder: Mandy Tyler, Carson Collier, and Chandler Tyler. By Cely's Dew Faro x Kerryarc Fern Gully. HM95572501. 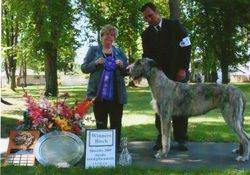 4-03-01 Breeder: Beverly C. Little & Putnam Little. 22. Mermaid Vainglorious of Kerryarc. HP334903/02. 1-1-09 Breeder: Mandy Tyler & Chandler Tyler. 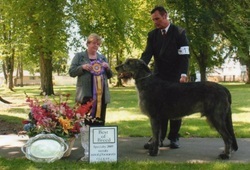 By Kerryarc Fighting Irish x Ch. Kerryarc Vaquera. HP169753/01. 5-13-05. 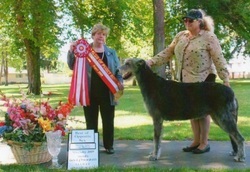 Breeder: Amy Benjamin, Mandy Tyler, and Doug Marx. Owner: Mandy Tyler, Carson Collier, and Chandler Tyler.